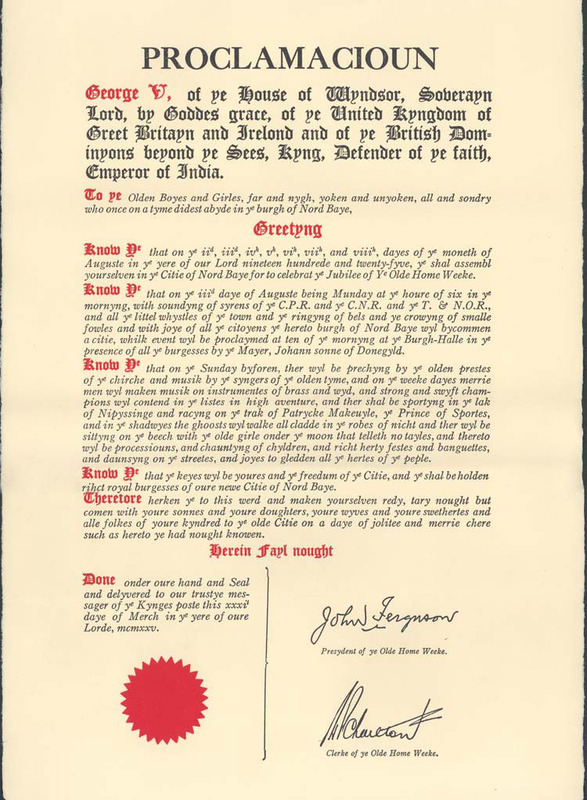 The 1925 invitation was in Old English and took the form of a proclamation from George V. It was addressed to all “Olden Boyes and Girles, far and nygh” asking them to assemble in North Bay on August 2nd through 8th for the celebration of Old Home Week. 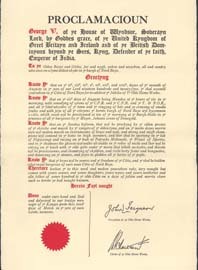 It was signed by John Ferguson as President of OHW. Produced on thick cream paper with decked edges and with a red seal affixed to it, the invitation looked very official. Music, parades, sports and dancing in the street was promised. Everyone who knew anyone who had lived in Norrth Bay in the past was therefore asked to help by providing names and addresses so those people could be personally invited and over 5000 invitations were sent out. If you are a collector, note that a facsimile of this invitation on thin paper and somewhat smaller was printed at a later date. The envelope that was used to send ot the invitations and the letterhead paper that was used by the committee was totally different. The logo on it, a drawing by local artist R.S. Huntingdon, shows two men, explorers, emerging from a thick forest, one of them portaging a canoe. They are approaching a lake with a sunset which proclaims “Prosperity for all”. The trunks of two tall trees are crossed by a banner to form the shape of a gateway. The banner proclaims: “The Gateway to the North .” In the corner is the text ” Back to ‘the Bay ‘ Aug. 2nd. to 8th. -1925.” The image is inviting and bids you to walk into the light and the promised prosperity along with the travelers. 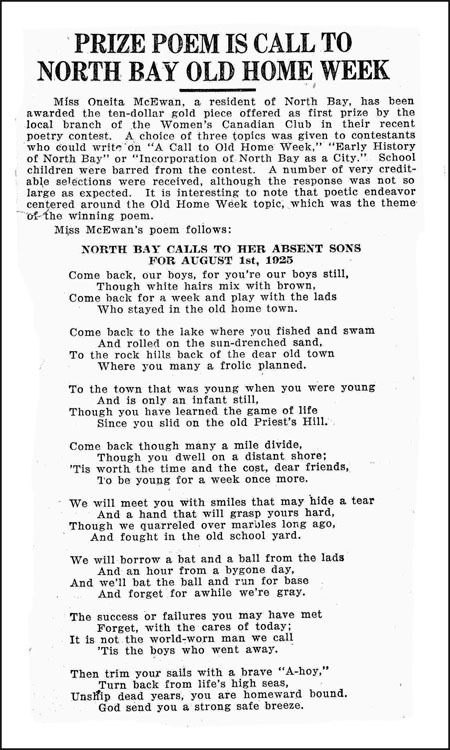 The Women’s Canadian Club held a competition in 1925 for the best poem on the history of North Bay, Old Home Week, or the incorporation of the city. The winning poem by Miss Oneita McEwan was in the “Call to Old Home Week” category. A large number of Old Timers attended OHW and helped to shape the nature of the celebrations. Veterans were remembered on Soldier’s Day. Old Timers played lacrosse and other sports. Mostly, they must have met old friends and reminisced. Unfortunately these stories were never recorded and the guest books that carefully recorded the names of all the guests that registered were lost with the rest of the Board of Trade records in a fire. The names of those who registered with the OHW committee, however, were published in the paper and a full list of these names could be compiled, although in some cases the microfilm is light and hard to read. The names of Old Timers (with the place they came from) published on August 7th, 1925 have been transcribed. Even from these names alone, one can see that people did come from great distances, but more came from Toronto than anywhere else. For anyone interested in these Old Timers from a genealogical purposes, the list is somewhat limited as women are often referred to only as Mrs. John Smith. This entry was posted in Celebrations, Community History, Documents and tagged North Bay, Old Home Week, Old Timers, R.S. Huntingdon on January 25, 2013 by Françoise Noël.